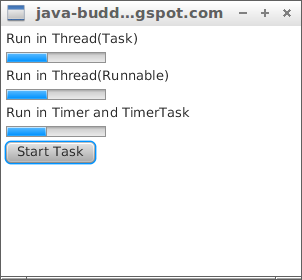 This example implement scheduled task, of Thread(Task), Thread(Runnable) and Timer with TimerTask. To update JavaFX UI ProgressBar. //Not work if update JavaFX UI here! HI, this helped a lot, thanks for sharing! Is not neccessary to update JavaFX UI with runLater in MyTimerTask.run() as in MyRunnable.run() ? Hello, I liked your tutorial, congratulations to the super blog !!!. My question is, how can I impregnate the idea of progressbar in a method where the button recognizes the method through the scenebuilder?